The Kampala contemporary art scene is increasingly becoming exciting. Artists’ niche to experiment and innovate with new media now facilitates them to convey different forms of visual narratives to their audiences through interaction with the artwork. By building installations in public space created from glass and mixed media, Stacey Gillian conjures a visual discourse that is both personal and intimate. The soft spoken artist’s works evolve around her personal experience of joy, triumph, pain and despair. She’s also inspired by those who surround her; the fragility of life and the complexity of living life on a day to day basis. Her installations of glass, resins and sometimes organic materials, is a metaphor to this narrative. 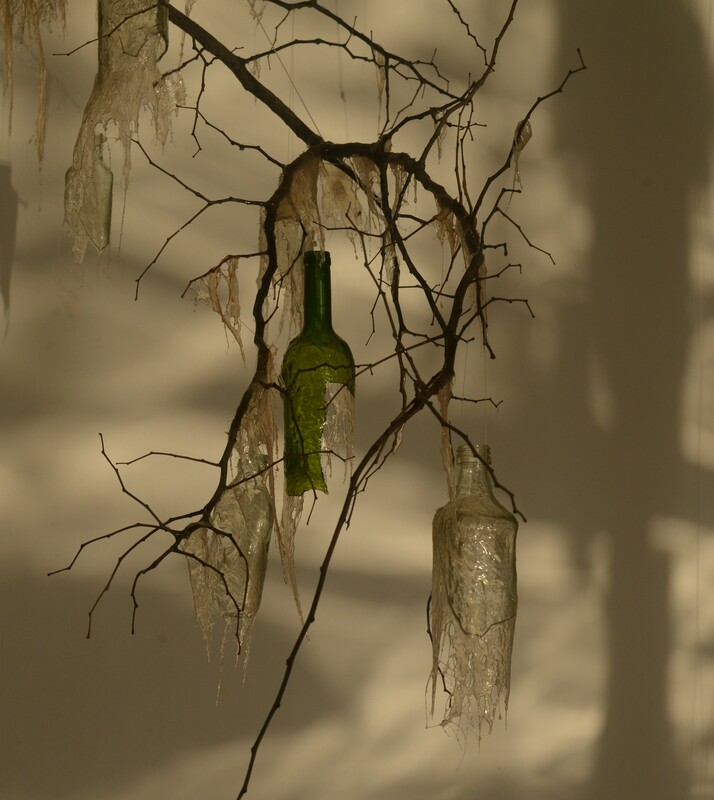 Finding Solace is an installation created from broken glass, resin and a dry tree branch that reflects the artist’s personal struggles at the time. The use of broken glass symbolises her emotions of anger, despair and pain. The dry tree branch secured from the vicinity of her abode during the Insakartists Trust Workshop represents her moments of restlessness. The installation was displayed at the Livingstone Art gallery, Zambia. “Finding Solace is a reflection of my moment of despair and anguish. The artwork came into life as a result of how I was feeling in this new territory. It was my first time to travel this far away from my family. I was also worried about my sister who was sick and needed surgery back home in Kampala,” says she. Sticky Situation alludes to hardships in life. The artwork was created after she visited a home for destitute children in Kariobangi South on outskirts of Nairobi. The community she says was littered with liquor glass bottles collected from the neighbourhood and dumped here. Immediately she feared for the safety of the life of children and through a exchange project with the Afrika Arts Kollective , Goethe Institut Nairobi and Pawa 254 she volunteered to make a permanent installation under the project name art crossing boarders from this synthetic garbage. 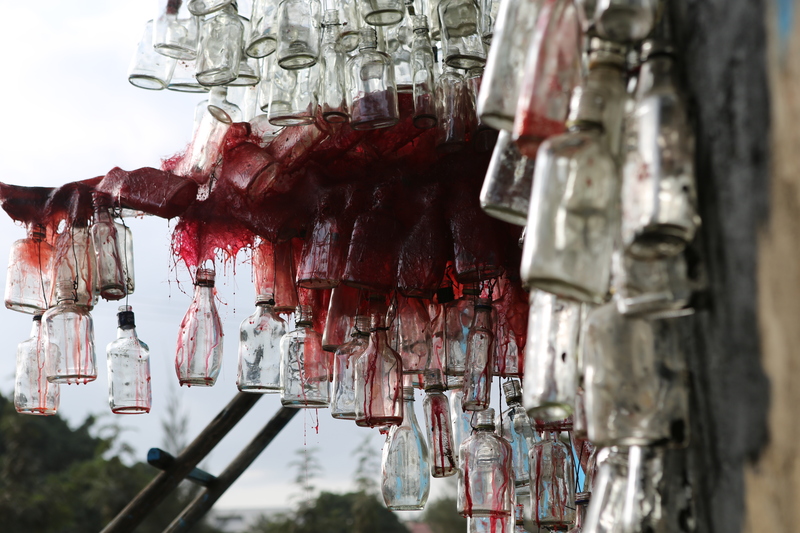 The artwork has liquor bottles suspended horizontally with red acrylic applied on the surface of the bottles using the dripping technique to create a visual illusion in her art. Stacey’s experimentation with glass has contributed to her self -discovery. Naturally, an impatient person, the artist has learnt to be patient and precise not only through her art, but also in interacting with people. Sticky Situation Installation at the South of Kariobangi Slum community in Nairobi. Image by Carrey Francis. During the preparations of KLA ART 014 festival, she was at first clueless on what artwork she should present for the Boda-Boda project she participated in. Through patience and self-analysis, she was able to come up with a body of work “funky glass ride” that experimented with the notion of using these mobile taxis in stylish fashion within the city. The decision to work with glass as a new material in the contemporary art is a bold step for this new-comer on the local art scene. Many artists shy away from it because of its fragility and complexity. The sight of broken glass and the dire possibility of cutting one’s self with the glass is horrifying! There’s also the probability of the audience confusing your art for something else. To achieve clarity, the artist must blend simplicity with creativity while building their installation. Simplicity is a dominant element that adds to the playfulness of her installation. Nevertheless, she sets a precedent for many other artists (not only female artists) to be open-minded and embrace new media in art. 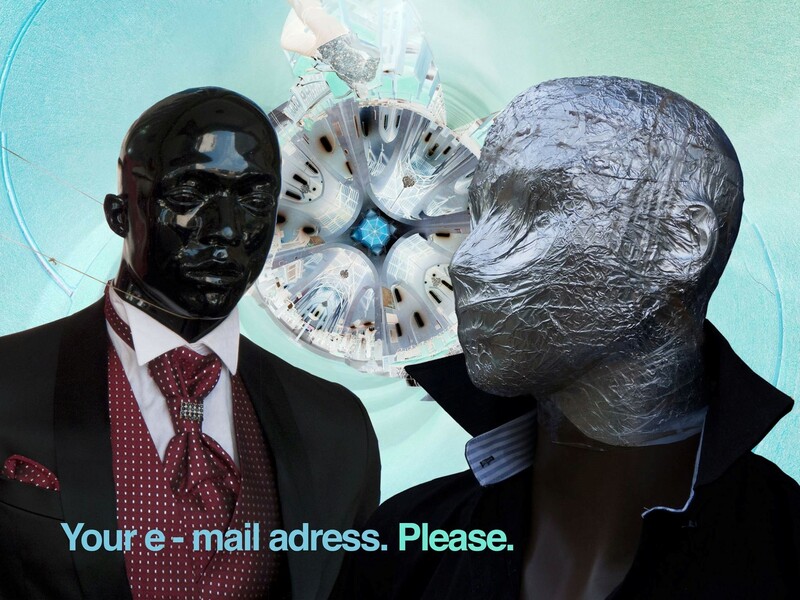 Such experimentations launch one’s career onto a path of international success with invitation to numerous art residences and workshops across the globe. For the moment, the sky is the limit for this young artist who’s defiant, bold and assertive, all reflected in her installations. Stacey Gillian graduated with BA of Art and Industrial Design from Kyambogo University (2014) and attended artist residency at 32° East. She has also participated in numerous workshops across the continent and recently provided an installation for the 9th Bayimba International Festival of Arts.